For the Cambridge college which was founded here, see Homerton College, Cambridge. Chat's Palace has been an important local arts centre and music venue for 30 years. It is housed in the former Homerton Library, the new one is close by. Homerton (/ˈhɒmərtən/ HOM-ər-tən) is a district in East London, England, in the London Borough of Hackney. 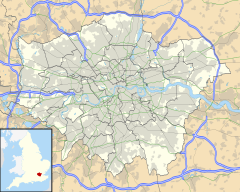 It was a suburb of the metropolitan area of London until 1965 when it was reformed and expanded. It is bordered to the west by Hackney Central, to the north by Lower Clapton, in the east by Hackney Wick, Leyton and by South Hackney to the south. In mediaeval times, Homerton, like much of Hackney, was predominantly rural and arable crops were grown, together with fruit and vegetables for the City of London markets. The majority of land was given over to pasture for sheep and cattle, and milk and cheese was also supplied to the City. Small kitchen gardens ran at the back of the houses along the road, with large fields behind. Domestic brewing was common (there are records of brewing performed at Sutton House and the Tan House). Many unsavoury activities (banned in the City) were also undertaken, such as tanning and fulling - the cleaning of felt cloth using urine. Homerton became a desirable suburb of London in the Tudor period, with many estates and grand houses being formed from the former Templar lands (Knights Templar of St. John of Jerusalem). The village was divided between Upper and Lower Homerton, with the later extending towards the marshes and the house at Hackney Wick. Upper Homerton was divided from the village of Hackney by the width of the rectory manor's Church Field, and a path led to the churchyard. In 1538, this estate, including other fields lying along the brook, passed to the Tudor diplomat Sir Ralph Sadler. Around 1560 part of this estate came into the ownership of Thomas Sutton, a resident of the Tan House (adjacent to Sutton House). This land formed part of his endowment of the Hospital of King James in Charterhouse, who continued to own the property until the 20th century, building Sutton Place between 1790 and 1806. Marsh Road, from Homerton High Street, led to, and across the marshes, towards the Templar owned water powered corn mill at Temple Mills. Prone to flooding, the marshes were primarily used for grazing. A Roman stone causeway was discovered in the 1770s. By 1795 the former Templar mills were being used for preparing lead. Sheets of lead were placed in clay pots and submerged in urine, then heated by decaying cow dung. The process converted the lead to lead oxide, and it was then finely ground to form a pigment for white, yellow and red lead paint. A new watermill was established on the marshes by Prince Rupert for an improved method of boring guns, however the secret died with him in 1682 and the enterprise collapsed. In the 18th century the availability of land, large houses and tolerance to dissenters made Homerton a popular place to found institutions. The educational ones were commonly known as Dissenting Academies. The Kings Head Society moved to a large house here in 1768, forming Homerton College for the education of Calvinist ministers with between 12-20 students. Religious education moved to the new University College London in 1826, but Homerton College remained here as a teacher training college until 1896, when it moved to Cambridge, eventually becoming a full college of the University of Cambridge in 2010. Students from Homerton college were principal in forming, in 1881, both the Glynn Cricket Club and Clapton Orient - which became Leyton Orient F.C. on its move to Leyton. The buildings of the College were rebuilt and expanded several times, but eventually lost to bomb damage in World War II. South of the Brook, by Money Lane, the Unitarian Gravel Pit Meeting House was built between 1715 and 1716. This was the result of an acrimonious split in the congregation of the Lower Clapton meeting. Notable nonconformist ministers preached at the Old Gravel Pit. 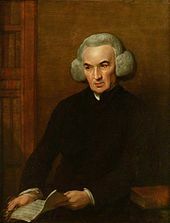 The moral and political philosopher Richard Price, known for his support of the American Revolution, became morning preacher in 1770, while continuing his afternoon sermons at Newington Green Chapel, on the green where he lived. Those who attended his sermons in Homerton included American politicians such as John Adams, who later became the second president of the United States, and his wife Abigail. On the 101st anniversary of the Glorious Revolution, he preached a sermon at Old Jewry meeting house entitled "A Discourse on the Love of Our Country", thus igniting a so-called "pamphlet war" known as the Revolution Controversy, furiously debating the issues raised by the French Revolution. Burke's rebuttal "Reflections on the Revolution in France" attacked Price, whose friends Thomas Paine and Mary Wollstonecraft leapt into the fray to defend their mentor. The reputation of Price for speaking without fear of the government on these political and philosophical matters drew huge crowds to his sermons, which were published and sold as pamphlets (i.e. publications easily printed and circulated). Another eminent minister was the formidable polymath, Joseph Priestley, discoverer of oxygen. When his support of dissent led to the riots named after him, he fled Birmingham and headed for London; he was appointed minister here in 1793. Today a Blue Plaque marks the site of the Gravel Pit Meeting House in Ram Place and a brown plaque marks the site of the Priestley's house at 113 Lower Clapton Road (on the corner of Clapton Passage). Priestley said of his time here, "On the whole I spent my life more happily at Hackney than I had ever done before". The meeting house is now used as a factory. 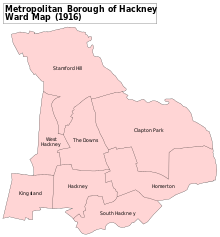 A map showing the Homerton ward of Hackney Metropolitan Borough as it appeared in 1916. A spur connecting the North London Railway at Dalston to Stratford, forming a part of the Eastern Counties and Thames Junction Railway, opened in 1847 for the carriage of coal. This resulted in Hackney Brook being placed in a culvert and the loss of the extensive watercress fields to the south of Homerton High Street. Its later development as a passenger line led to the redevelopment in the 1880s of the mediaeval core of the village on Homerton High Street with Victorian dwellings and public houses, and speculative building on the lands either side of Homerton High Street. In 1868 Homerton Station opened. By the 1860s, London fell prey to epidemics of fever. The 200 bed Eastern Fever Hospital was founded in September 1870 by the Metropolitan Asylums Board to prevent contagion. There were six wards for typhus, two each for scarlet fever and enteric patients. 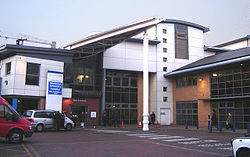 Two smaller wards were reserved for 'special cases'. The buildings were demolished in 1982 and the site became the core of the modern Homerton University Hospital. This replaced the old Hackney Hospital which (in turn) had been formed from the Hackney Union Workhouse. 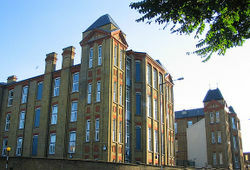 These buildings are now used by the Hackney Mental Health Trust. The coming of the railways and the building of the fever hospital drove many of the wealthier residents away. The tightly packed Victorian streets provided homes for the clerks and employees of the new purpose built factories (like Berger Paints) being built in the area. From 1937 onwards, the London County Council built mass housing, sweeping away the worst of the slums, but also eliminating many older buildings containing shops on Homerton High Street, effectively destroying it as a commercial area. The Lesney die cast model factory was built in the 1940s on the Homerton side of the Lee Navigation, just north of Homerton Road, producing for many years their Matchbox brand. The factory closed in 1990, and was demolished in 2010. The oldest surviving residential building in Hackney is Sutton House on Homerton High Street. It was built in 1535 and is owned and run by the National Trust. Hackney Hospital, August 2005. Marc Bolan (born, Mark Feld), and Anthony Newley were both born here. 1970s glam rock singer Marc Bolan and actor Ray Winstone were born in Hackney Hospital, on Homerton High Street. The hospital, originally built in 1841 as the Hackney Union workhouse, finally closed in 1995. The old hospital was refurbished in 2006 and reopened to serve the mental health trust. Homerton's links with popular music continued with the arrival of Toe Rag Studios, relocated from Shoreditch to the Lower Clapton/Homerton border, an eight-track recording studio which uses reclaimed 1960s analogue equipment, where notably the White Stripes' acclaimed 2003 album Elephant was produced. More recently, Sound Savers studios was also established in Homerton, and Gun Factory Studios relocated to the area from Stoke Newington. Babyshambles frontman and ex-Libertine, Pete Doherty has given his address as Homerton and it has been previously reported that he received treatment as an outpatient at Homerton University Hospital. Peter Mayhew the founding member of the band Palma Violets is also thought to live in the area. Homerton is also home to Chats Palace arts centre, named after the nearby Chatsworth Road. Chats Palace has presented and encouraged a wide variety of music, comedy, theatre, photography, carnival, disability arts, dance and transgressive performance, including Clifford Jarvis, Tom Hunter, Miniscule of Sound, Red Saunders, Asian Dub Foundation and Graeae Theatre Company. It also hosts an array of classes for all abilities and age ranges, and has been an accessible and affordable space for local people to celebrate their important occasions or present their projects. 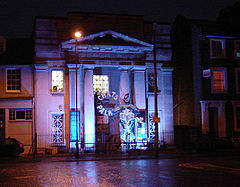 The building itself was originally established as a Carnegie library for the betterment of the people of the East End. The council closed the library in 1977 but the building was reclaimed by members of the local community. For further details of education in Homerton, see List of schools in the London Borough of Hackney. Secondary schools located in the area include Cardinal Pole RC School and the City Academy, Hackney. Homerton is served by London Overground at Homerton railway station, with westbound trains to Richmond and Clapham Junction via Dalston Junction, and eastbound trains to Stratford. The original station was opened on 1 October 1868. Services ceased on 15 May 1944 with a substitute bus service provided until official closure on 23 April 1945. Other than a partial section of wall to the north of the bridge over Barnabas Road, the original 1868 station has been demolished. Although of reduced size, the original station building would have been similar to buildings remaining at Hackney Central and Camden Road. The present basic station was opened on 13 May 1985. Homerton is served by a large number of London Buses routes 236, 242, 276, 308, 394, 425 and 488 as well as the W15. Hackney is also served by the London night bus network by route N26. ^ A Fast Sermon - Richard Price to the Old Gravel Pit Meeting - 21 February 1781 accessed 4 June 2009. ^ "Hackney - Archives and local history | Joseph Priestley". hackney.gov.uk. Retrieved 31 July 2016. ^ Ray Winston Biography accessed 10 May 2007. ^ The Sun - Doherty arrested again accessed 19 January 2007.